The EPISD mess over bond program contracts appears to be deeper than we have been led to think. 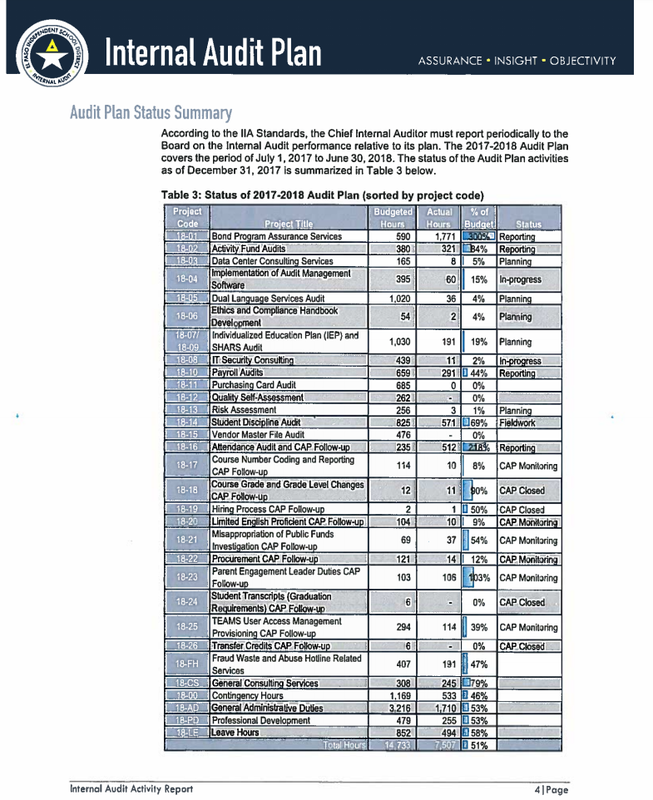 The top item was an audit of a request for quotations process for bond program management advisory services. Was the process conducted fairly? Was it done according to the rules? We do know that the district has cancelled the procurement. The draft report will make for interesting reading. Will people be held responsible for this? This entry was posted on Friday, January 19th, 2018 at 5:00 AM and is filed under El Paso Independent School District. You can follow any responses to this entry through the RSS 2.0 feed. You can leave a response, or trackback from your own site. Did you know their website was down this past weekend because they forgot to pay for their domain? They claimed there were having technical difficulties. Lies. Dori gets all the credit. And El Paso Inc made Fenenbock and Cabrera “El Pasoans of the Year” for 2016 for their stunning success in getting the bond passed. Wonder how much of that Billion$$$ Bond, Cabrera put into Fennenbocks Congressional campaign?? She did not need any of his money, she has the support of Charter and Choice people and they have unlimited money. No body responsible for anything at EPISD. Nobody knows nuthin, nobody did nuthin, nobody heard nuthin. Just waste, tax, spend, tax some more. Cabrera has that BILLION$$$ Bond slush fund got to blow it off. EPISD- Inherent corruption. More hours at the task mean more hours to bill, right? Milk it, milk it…That’s SOP in this city. There are 2080 man hours in a year (assuming a 40 hour workweek). How many internal auditors do they have? Because leave is a line item, it appears they are employees (and internal audit teams normally are, that is why it is called internal bs external audit), but the total number of hours listed seems pretty high for a function that should be reviewing records (typically on some sort of a sampling plan basis).